Enterprises look toward remote IT infrastructure management services to provide a competitive advantage. A robust IT infrastructure enables efficient delivery of services and improves overall business performance. GIS’s Remote IT Infrastructure Management Services can help design, build, run and manage your IT infrastructure services in a flexible manner that allows for better integration with the existing processes and resources. GIS can help achieve the highest levels of business transformation by enabling companies to get the most from their IT infrastructure services. GIS virtually every aspect of the IT discipline with one of the industry’s broadest suite of service offerings. Whatever your IT infrastructure challenges are, GIS’s Remote IT Infrastructure Management Services can help keep your infrastructure up and running. 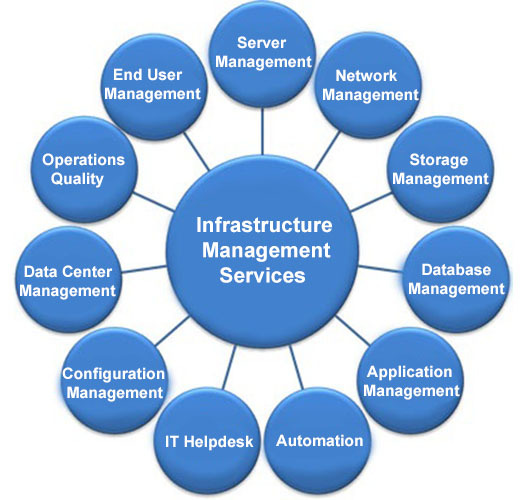 GIS infrastructure managed services offers a comprehensive range of services to help customers reduce costs. Our Remote Infrastructure Management Services provides a flexible, affordable suite of services to help you monitor and manage your infrastructure more efficiently and cost-effectively. We carry rich expertise in areas of remote IT infrastructure management and support services. We provide a comprehensive set of best practices for IT service management, which helps to achieve business effectiveness and efficiency in the use of Information Technology. ITIL process alignment Improves Infrastructure Performance Availability Measurable & Visible IT Service Management Faster & Improved ROI on IT Investment Reduced Security Threats Real Time expert system problem detection & remediation Increased confidence of all stakeholders in the overall IT Infrastructure Remote Infrastructure Management (RIM) refers to remotely managing information technology (IT) infrastructure such as workstations (desktops, laptops, notebooks, etc. ), servers, network devices, storage devices, IT security devices, etc. of a company.